By Conor McNally | December 1, 2015. Pitch-perfect performances and elegant direction from Steven Spielberg turn a decades-old historical event into a human and relevant story about a man making the difficult decision to stand by his principles in the toughest of circumstances. 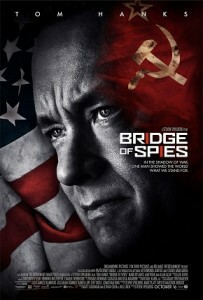 Bridge of Spies is about lawyer James Donovan (Tom Hanks) who is forced to defend Russian spy Rudolf Abel (Mark Rylance) on charges of treason during the height of the Cold War in the late 1950s. It is established right away that Abel is guilty, but Donovan believes he deserves a fair trial and fights for him despite governmental pressures. Later on, Donovan’s sense of fairness is tested again as he is sent by the US to Berlin to negotiate with the Russians and East Germans for a trade of prisoners. Donovan has to navigate a maze of bureaucracy and diplomatic pressures from all sides to try to secure the release of American prisoner Gary Powers (Austin Stowell). Tom Hanks plays the role of Donovan with the assuredness and likeability that’s been his calling card for decades. It’s hard to imagine anyone else playing the role without descending into self-righteous smugness but Hanks has being playing fundamentally decent men for a long time and his performance is subtle while still powerful. Rylance’s performance is the highlight of a film filled with good acting. He portrays the quiet spy as a man just doing his job in a tough situation and accepts everything thrown at him with steely resolve. Rylance’s understated performance, as a man stuck in the middle of titanic political forces, allows the audience to come to sympathise for Abel without the need for any of the emotional manipulation that Spielberg is sometimes accused of using. It’s so easy to stick your nose up at Spielberg. For some people, the adjective Spielbergian has become pejorative shorthand for films considered old-fashioned and overwrought with emotion. It’s important to acknowledge that these people are wrong and are quite possibly soulless ghouls. In all seriousness, Spielberg is probably the greatest living filmmaker. Spielberg is a master in tone and character and story and speaks the language of film as fluently as anyone ever has. Not every movie he’s made has been perfect but he’s made more perfect movies than almost anyone. Bridge of Spies is a lesser film in the canon of Spielberg. Most directors would kill for such for an achievement. Overall I would give this movie 4 stars.